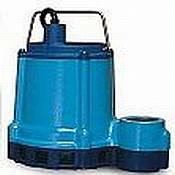 The Big John submersible sump pumps provide efficient; trouble-free service for extended or continuous use in moving large volumes of water. A choice of manual or automatic versions with various switch configurations provides the user the right pump for their needs. Little Giant's submersible sump pumps are ideal for use in Excavation; Crawl Space; Basement; Underground Passageway; Loading Docks; Grain Elevator; Construction Site; Cooling Tower; Fire Cleanup and other applications requiring high volume water dispersal. Cast bronze or cast iron pump housings with protective epoxy coating for corrosion and rust resistance. Oil filled motor housing for lifetime lubrication and rapid heat dissipation. Stainless steel screws, bolts, and handle.